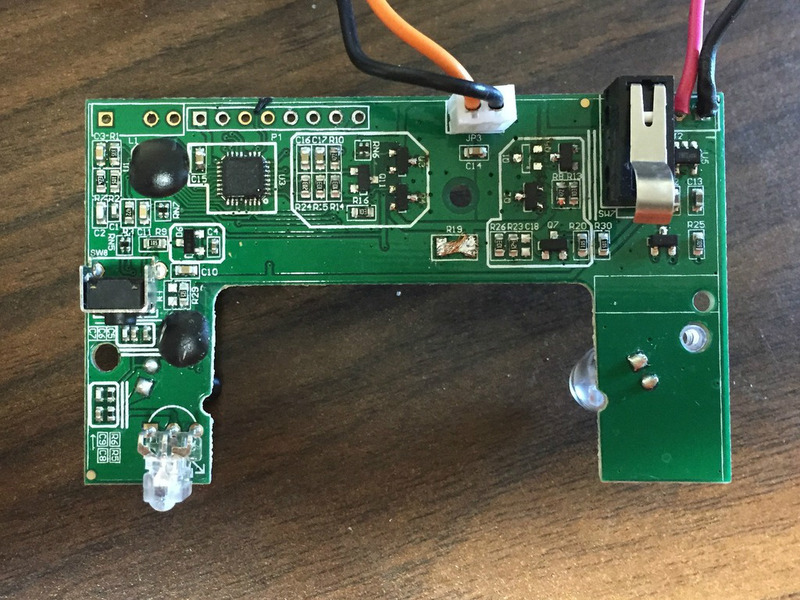 If you’ve been hanging out here at Hackaday for awhile, you’ve certainly seen projects that were based around the concept of putting a miniature computer inside the carcass of some other piece of electronics. In fact at this point it’s something of a running joke, certainly we must have seen an Arduino or Raspberry Pi shoehorned into every type of consumer gadget ever built by this point. But if you thought this would be another example of that common trope by the headline, you might be in for something of a surprise. [zapta] didn’t put an Arduino inside this GOJO LTX-7 soap dispenser, it was already in there to begin with. That’s right, apparently we’ve hit the point that even cheap soap dispensers are now running on programmable microcontrollers. While we can’t blame those of you who are no doubt groaning and/or rolling their eyes thanks to this particular case of computational gluttony, it does mean we’re able to report with a straight face something which frankly would have passed as an April Fool’s joke in previous years: the development of an open source soap dispensing firmware. So how does one upload a new Arduino sketch to their GOJO soap dispenser? It’s not like the thing has a USB port on the side for convenient hacking. As explained by [zapta], it involves stripping the dispenser all the way down until the electronics board is free, and then adding in a programming header to make subsequent firmware fiddling a bit easier. Writing a new firmware to the ATTiny48 powered board will require an external ISP (the Atmel AVRISP MKII was used for this hack, though any should work), but it’s otherwise pretty painless. [zapta] has done an excellent job documenting the different components on the board, and reverse engineered enough of the critical aspects (such as the motor controller and proximity sensor) to write a new open source firmware which can be flashed to the GOJO LTX-7. Beyond allowing you to “Open Source All the Things”, using this new firmware does have some practical advantage in that you can configure how much soap is dispensed per activation. Going further, we’d be exceptionally interested in hearing about anyone who manages to come up with a firmware that enables some hitherto impossible soap dispensing trickery. We’ve seen hacks involving dispensers of all types, from Halloween games that spit out candy to gadgets which let dogs get their own treats, but a soap dispenser hack is something truly new for us. More proof that there’s still plenty of hardware out there just waiting to be hacked! His write-up is a pretty fun read, walking through his process, including an oscilloscope measurement showing how the capacitors’ voltage drops from 5.26 V to 3.5 V when the trigger is pressed, and interestingly, slowly recovers until it’s released a second later, when it then rises back to 4.5 V. He’s even included how he worked out of the panel’s maximum power point (MPP), which is what he was doing when the kids were first lured away to blow soap bubbles. But we’re sure Hackaday readers aren’t as easily distracted. Want to instead fill your neighborhood with soap bubbles? Check out this 14,000 BPM (Bubbles Per Minute) 3D printed soap bubble machine. Or maybe something more relaxed is your speed. Post an animation on Reddit of a workable machine that looks neat and does something cool and the next day someone will have built it. That’s what happened when [The-Big-Ship] uploaded an animation of a clever bubble making machine — though we had to look twice to convince ourselves that it wasn’t real. The next day [Over_Engineered_2] posted a video of his working one. We often hear that you need precision CAD software such as Solidworks and AutoCAD to design a functional machine but the animation was done using Cinema 4D, used for films such as Iron Man 3 and Tron: Legacy. This shows that you can at least get a reassurance that the basic mechanics will fit and move together without having to design precision parts. That’s not to say that reality didn’t interfere with implementing it though. In [Over_Engineered_2]’s video below he points out that the bigger ring of the original animation didn’t work with his small motor and propeller, and had to switch to the smaller ring. Also, note that the ring needed guide rails on the sides to keep it from twisting, something a real world ignoring animation can get away without. Check out the videos below to see the two in action. At first glance, it’s easy to dismiss the creation of custom bath soaps as far outside the usual Hackaday subject matter, and we fully expect a torrent of “not a hack” derision in the comments. But to be able to build something from nothing, a hacker needs to be able to learn something from nothing, and there is plenty to learn from this hack. On the face of it, [Gord] is just making kitschy custom bath soaps for branding and promotion. Cool soaps, to be sure, and the drop or two of motor oil and cutting fluid added to each batch give them a little machine shop flair. [Gord] experimented with different dyes and additives over multiple batches to come up with a soap that looked like machined aluminum; it turns out, though, that adding actual aluminum to a mixture containing lye is not a good idea. Inadvertent chemical reactions excepted, [Gord]’s soaps and custom wrappers came out great. So where’s the hack? In stepping way outside his comfort zone of machining and metalwork, [Gord] exposed himself to new materials, new techniques, and new failure modes. He taught himself the basics of mold making and casting, how to deal with ultra-soft materials, the chemistry of the soap-making process, working out packaging and labeling issues, and how to deal with the problems that come from scaling up from prototype to production. It may have been “just soap”, but hacks favor the prepared mind. Kickstarter started out as a platform for group buys, low-volume manufacturing, and a place to fund projects that would otherwise go unfinished. It would be naive of anyone to think this would last forever, and since these humble beginnings, we’re well into Peak Kickstarter. Now, Kickstarter, Indiegogo, and every other crowdfunding platform is just another mouthpiece for product launches, and just another strategy for anyone who needs or wants money, but has never heard of a business loan. Of course there will be some shady businesses trying to cash in on the Kickstarter craze, and over the last few years we’ve done our best to point out the bad ones. Finding every terrible Kickstarter is several full-time jobs, but we’ve done our best to weed out these shining examples of the worst. Following up on these failed projects is something we have been neglecting, but no longer. Below are some of the most outrageous Kickstarters and crowdfunding campaigns we’ve run across, and the current status of these failed entrepreneurial endeavors. Kids generally can be amused pretty easily, but when jangling keys stop holding their interest you might want to take a look at [drenehtsral]’s new project. He’s created an automatic bubble robot (YouTube link) that keeps the kids endlessly entertained! The project started as an idea at a festival where one of [drenehtsral]’s kids took great interest at a bubble machine. [drenehtsral] had never heard of a bubble machine before, but it turns out that it’s pretty simple in practice. All that’s required is a tank of soapy water, a motor to turn the bubble wands, and a fan to form the bubbles and make them waft gently through the air. [drenehtsral] also used a 12V battery for power, some other hardware to hold it all together, and a 5V regulator and some other control electronics for the fan and the motor. He notes that he could have bought a bubble machine but in true hacker style found it fun to build himself. The next step in this project could be something to vary the size of the bubbles, or perhaps a set of wheels for the robot so it can entertain the kids on the move!